(CNN) -- Los Angeles Lakers center Andrew Bynum was forced to retire from the fourth game of the NBA finals with an ongoing knee problem, as his team went down 96-89 to the Boston Celtics. Bynum had fluid drained from his knee just days before the first game of the best-of-seven series last week, but until now the injury has not hampered his performance. However, the 22-year-old spent almost half of Thursday night's game in Boston on the bench, only managing 12 minutes of action in the second half as L.A.'s East Coast rivals leveled the finals at 2-2. "Obviously we miss Andrew when he's not out there," the Lakers' Spanish center Pau Gasol told his team's official Web site. "He's been so effective blocking shots and rebounding. Those two things alone are a big plus for us." Trailing two points going into the last quarter, the Celtics came from behind to win the game to prevent the defending champions from pulling ahead in the series. Paul Pierce was Boston's top scorer, finishing with 19 points. 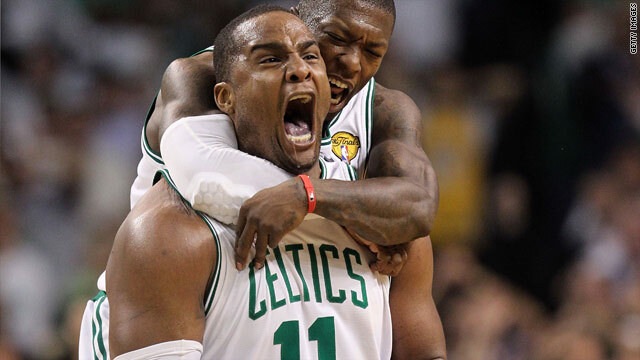 But veteran Celtics players Glen Davis and Nate Robinson were instrumental in their team sealing the win. Coming off the bench Davis scored nine of his 18 points in the final quarter and Robinson all of his 12. "I just felt like a beast. I just felt like I couldn't be denied," Davis told the official NBA Web site. "It was all will and determination. This is where you grab the moment. All you can do is play in the moment." Lakers coach Phil Jackson believes that his team were outplayed by the New Englanders, especially in the closing stages of the game. "They really stepped on it in the fourth quarter," said Phil Jackson. "We seemed to not be able to stop the momentum of their game. And Jackson has hinted at a change of tactics in the next game in order to make the most of guard Kobe Bryant, who scored 33 points but was not effective in the fourth quarter. "He was tired," Jackson said. "Physically he had to work too hard in the course of the game, and he couldn't finish it out like he wanted to. We'll have to do something different the next game to get him off the floor and keep him ready for that fourth quarter." The Lakers are now hoping they can bounce back in game five, hopefully with the help of a fully fit Bynum, and not allow the Celtics to take a series lead. "I think we have enough in our arsenal to produce," said Gasol. "We know what to do, we know how to get it done. Game five will take place in Boston on Sunday, before the series moves back to L.A. for the sixth, and if required, seventh game. The Celtics are seeking a record breaking 18th NBA title, and the Lakers their 16th.